Serim® PyloriTek Test Kit detects urease activity in gastric biopsy specimens which is a presumptive identification of a Helicobacter pylori infection. The PyloriTek dry reagent technology has several distinct advantages over other rapid urease tests (RUT) using gel- or liquid-reaction media. PyloriTek test results are available in 1 hour allowing for discussion of the results with the patient before he/she leaves the facility. Most positives appear in 15 minutes or less due to the patented PyloriTek method that allows the urea/urease and ammonia/pH paper reactions to take place in separate, optimal environments which accelerates the rate of the reaction and minimizes blood or tissue fluid masking the color reaction. Each PyloriTek strip also has a built-in positive analyte control and a negative control which run concurrently with the test specimen. The PyloriTek positive control automatically appears with every test within the normal 1-hour time with no extra steps or materials needed. With competitive tests the positive control is run after waiting 24 hours then inserting a urease positive control material. Some investigators have reported that, due to the patchy distribution of H. pylori in the stomach 2 or 3 biopsies from several areas of the stomach can increase chances of finding infection. If you choose to take extra biopsies, up to 3 specimens from the same patient can be placed on a single PyloriTek strip with separate and distinct results for each biopsy. Published studies in major journals have shown that PyloriTek possesses excellent sensitivity and specificity in diagnosing H. pylori infections. In carefully controlled studies involving over 500 patients, PyloriTek showed average specificity of over 97% and sensitivity of over 96% when compared to at least two reference methods. This is not data from a single selected study which shows the best results from one institution, but a summary from all the institutions which have done unbiased studies comparing PyloriTek to other RUT and histology methods. Four additional papers are available, including a pediatric study. 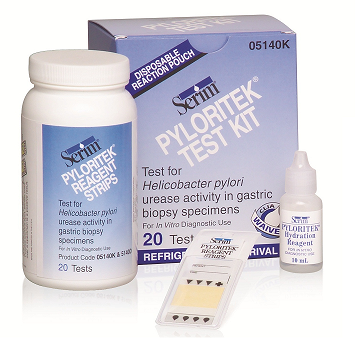 Why choose Serim’s Helicobacter pylori test kit?